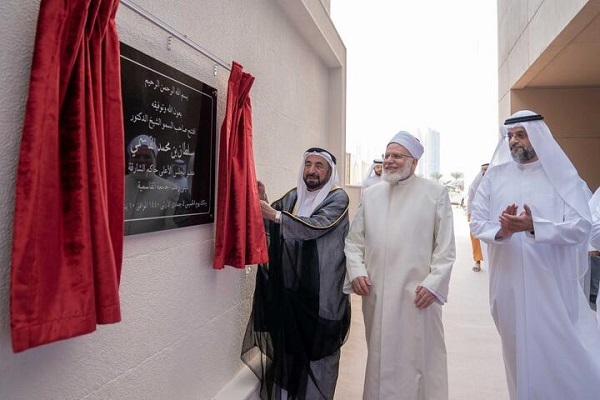 Dr Sheikh Sultan inaugurating the Waqf Tower. Sharjah authorities have announced the launch of the Waqf Tower at the Al Qasimia University, which boasts 31 residential floors, with 186 apartments and four shops, spread over an area of 40,568 sq m.
The tower is situated in the Al Taawun area, next to the Al Khan Lagoon in Sharjah, and constructed with a donation from the Sharjah Islamic Bank and a voluntary contribution from the Sharjah Electricity and Water Authority (Sewa), which ensures free delivery of electricity and water services. It was inaugurated by HH Sheikh Dr Sultan bin Mohamed Al Qasimi, Supreme Council Member and Ruler of Sharjah, in the presence of Sheikh Sultan bin Mohammed bin Sultan Al Qasimi, Crown Prince and Deputy Ruler of Sharjah, and other senior officials. The inauguration of the new tower is in line with the bank's social responsibility and its commitment to support several community-based initiatives and enhance various Waqf initiatives in the Emirate of Sharjah and the UAE, reported state news agency Wam. The well-designed quality apartment building has several spacious flats, a swimming pool, a game room, a multi-function hall, and various services and utilities that enhance the comfort of residents, it added. Dr Sheikh Sultan lauded the Sharjah Islamic Bank’s Waqf initiative, aimed at building several Waqf towers, highlighting the private sector’s role in supporting the community and the scientific and research sector. The Sharjah Islamic Bank also presented a commemorative plaque to Sheikh Dr Sultan. Chairman Abdul Rahman Al Owais stressed that the inauguration of the new tower is a continuation of the efforts of the Sharjah Islamic Bank to serve the community. He said that the revenues of the tower, which was implemented by ASAS Real Estate, Sharjah Islamic Bank’s real estate arm, will be allocated to support Al Qasimia University to meet the needs of its students, in line with the directives of Sheikh Sultan to enhance donations.